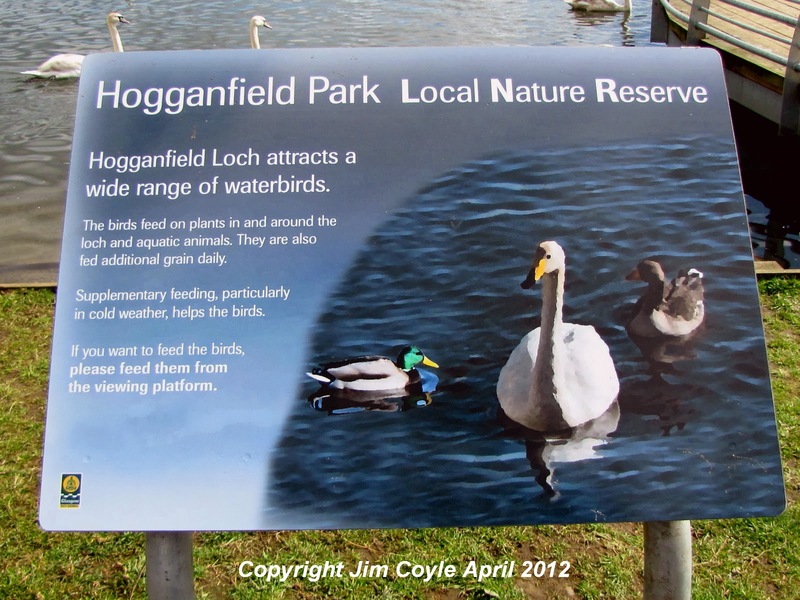 Sitting between the M8 and M80 to the north east of Glasgow City Centre Hogganfield Park is a Local Nature Reserve that is a great spot for birdwatching not only in Glasgow but across Central Scotland. The park has featured in the BBC programme Springwatch. The park is dominated by Hogganfield Loch a large shallow loch with a wooded island. The loch and the surrounding grasslands, marsh, pools, ponds, scrub and woodlands were declared as a Local Nature Reserve by Glasgow City Council in 1998. The loch supports a tremendous variety of birds attracted by a healthy population of invertebrates and fish. You can see birds such as Great Crested Grebe, Tufted Duck, Goldeneye and Goosander at close quarters. A wetland complex of open water and marsh has been created on the eastern side of the reserve. This area is particularly attractive in summer with the flag iris, reedmace and rushes becoming alive with birdsong. In late autumn and into winter, Jack Snipe can be found in the marsh. It is not just the wildlife that have benefited from improvements to the park also has a viewing/feeding platform allowing walkers to get access to the loch edge. The park also boasts a children’s play facility situated in the southeast area of the park, orienteering course, sandy beaches beside the loch and picnic tables. It was the the first Local Nature Reserve in Glasgow to receive a Green Flag award, in 2013, as recognition of the work that has gone in to the park. There really is something for everyone and really is worth a visit. The Friends of Glasgow’s Local Nature Reserves have worked since 2010 worked to raise awareness of the city’s Local Nature Reserves and wildlife. To find out what the group are up to check out their facebook page or become a member. Since we published this post we have been able to speak to Jim Coyle, Chair of Friends of Glasgow’s Local Nature Reserves who shared his thoughts on Hogganfield Park. What makes Hogganfield Park special? Put simply, Hogganfield Park LNR is one of the best parks for wildlife in Central Scotland. It is also good for people, young and old, who use it for walking, cycling, jogging, meeting friends or just feeding the ducks. One of my most favourite memories is of seeing a family of Whooper Swans landing on the loch at the end of their journey from Iceland. Another is the look on people’s faces when you tell them that the Whooper Swans, the ones with the yellow beaks, have chosen to winter in Glasgow having flown all the way from Iceland! What does Hogganfield Park mean to you? Simply, I love it; and I am pleased that the Council, despite lack of funds, has managed to keep finding ways of undertaking improvements for people and wildlife. What plans do Friends of Glasgow’s Nature Reserves have? We hope to raise money to allow us to install a small group of floating islands on the loch to act as breeding platforms for birds such as grebes. These islands will also provide excellent conditions for invertebrates and fish to flourish whilst also improving water quality. Over the winter months we also hope to once again carry out a number of wildfowl feeding sessions, guided walks and litter picks and hope that local people will come out again and support us. Hogganfield is one of the best places to see wildlife up close in Glasgow and I love going to visit it. The floating island project is very interesting. Hogganfield is beautiful. I love the wild birds, the greenery around the loch, and the friendly people using the park. Yes, the floating islands sound like a good idea, as I remember seeing swans making their nest right next to the shore, which could be easily disturbed by people, dogs and predators.. Good luck! I visit Hogganfield Park LNR regularly, it’s a lovely place to enjoy trees, birds and flowers and get some much needed fresh air and exercise. The floating islands for the loch sound like an innovative way to provide safe nesting places for grebes and improve water quality too. I have fond childhood memories of when I lived in Ruchazie and would go up to the loch fishing with my pals. We usually managed to catch the odd pike or perch. Never see anyone fishing there anymore! I left Glasgow forty odd years ago but well remember Hogganfield Loch from my childhood. There seemed to be many more facilities there in the old days. There were rowing boats and motor boats on the loch, an 18 hole pitch and putt course, and a cafe upstairs in the pavilion building selling ices, soft drinks, teas etc. The rowing boats were heavy and clumsy craft which, even then, seemed ancient. The two motorboats were named the “Hogganfield” and the “Ruchazie” and were driven (if that is the word) by Parks Dept employees. A ten/fifteen minute sail cost about three old pennies if memory serves. On my more recent visits I noted that all these facilities were long gone, but, on the other hand, there seem to be more wild birds than ever and a greater variety of them. I developed my love of Wildlife as a child visiting Hogganfield Loch in the 1970’s-80’s. I remember the Park Warden who visited our school in Craigend and how he always had time to explain all about the different birds when you visited the park. Sadly, I don’t remember his name but I do think it was his enthusiasm for wildlife that gave me the urge to move into conservation as a career. 30 years on and still loving it. I visited Hogganfield a few weeks ago when on a visit to relatives in Glasgow and was impressed by the conservation work that has been done. I was also saddened to see the old Tea-rooms and Boat shed, along with the boats all gone. Great memories of a much loved park.